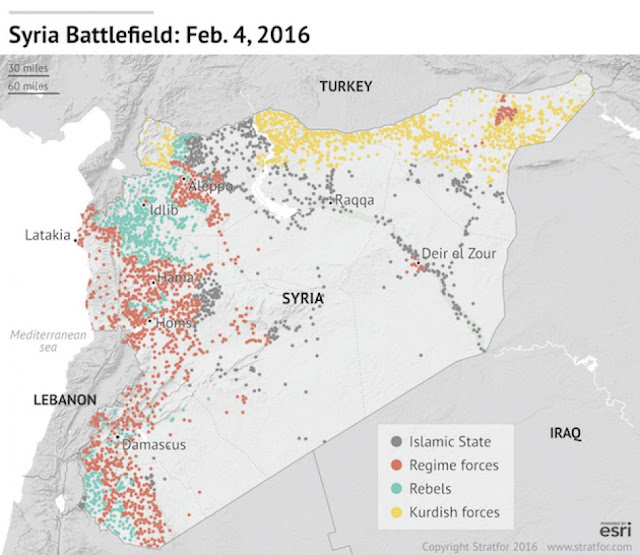 Tempos Interessantes: Syria: Here We Go! There is a significant number of people in the American political, media and academic circles, who just cannot stop advocating a strong US military intervention in Syria. These people simply cannot conceive of a conflict going on somewhere without American participation. The messy and dangerous Syrian battlefield. These people fit into two broad categories: one is the Republican hawks who believe the United States should go, guns blazing, and obliterate any conceivable enemy or threat to US national security and they are very good at finding (or inventing) these threats. The other are Democrats whom Katrina Vanden Heuvel labelled “liberal Indispensable Nation advocates” (https://www.washingtonpost.com/opinions/sanders-should-challenge-the-foreign-policy-status-quo/2016/02/09/ca5052e0-ce92-11e5-b2bc-988409ee911b_story.html?wpmm=1&wpisrc=nl_opinions ), who believe the US should take (their) moral high ground and go, guns blazing, on a quest to right the world’s wrongs; they are also very good at identifying countless situations where they think US troops can save the world. There is a path toward ending the horror in Aleppo — a perfectly realistic path that would honor our highest ideals, a way to recover our moral standing as well as our strategic position. Unfortunately, the realities on the ground do not have any compassion for from the couch moralistic solemn statements and melodramatic whining, meaning that it is far from clear that American troops on the ground are the antidote to mayhem in Aleppo, or to anywhere in Syria, Iraq, Libya, or Yemen, for that matter. They go on to admonish that If the Russians and Syrians sought to prevent humanitarian protection and resupply of the city, they would face the military consequences. So, their “realistic path” entails the possibility of transforming the Syrian War into a war between the United States and Russia! Way to go. Save (???) Aleppo, and engage in great power conflict. Of course, the authors go on hopefully saying that the Russians would chicken out under threat. Unfortunately, from their point of view, given what we have seen from Moscow and Washington these last few years, it is far from clear that that would be the outcome. Nevertheless, the bottom line is that the risk of a major mishap is too great, the probability of failure is even greater and there could be dire consequences. I have the greatest sympathy for the suffering and hardship of the war’s innocent victims and I wish their terrible ordeal could be over immediately. However, there are a few things one has to bear in mind. 1- Leading a state, especially in wartime, is a huge responsibility and frequently, not all goals can be achieved. Then, there has to be a selection of the most important, the most attainable and the least risky, all taking into account the national interest. And, in the harsh world of Power Politics, morals do not and cannot always take centre stage. 2- An American intervention would aggravate the conflict in terms of scope, violence and victims, not to mention the possibility of evolving into a much more serious conflict. Those who defend American armed intervention anytime, anywhere, against anyone to satisfy their personal and public goals and sensitivities, suffer from a dangerous mix of hubris, naiveté and fanaticism. Their relentless lobby and pressure for armed intervention is a liability for the United States and the world.